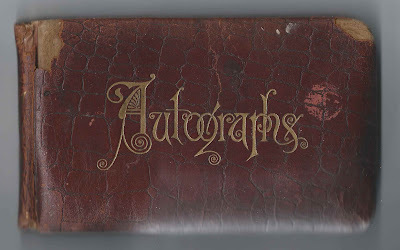 1880s/1890s autograph album of Sarah A. Stout of the Columbus, Ohio, area, with autographs from before and after her marriage to William W. Hennick. The album is approximately 7" x 4-1/4" with puffy leather or faux leather covers and contains about 38 pages signed by Sarah's relatives, in-laws and friends. From online research, hopefully correct: Sarah A. Stout was born about January 1866 in Ohio, the daughter of Daniel Stout. I found a reference where she was the daughter of Daniel and Rebecca Stout of Fairfield County, Ohio, but Rebecca may have been the wife of Sarah's father at the time of Sarah's marriage, not necessarily Sarah's birth mother. The reference was at a subscription site where I don't have access, so I can't tell you more. 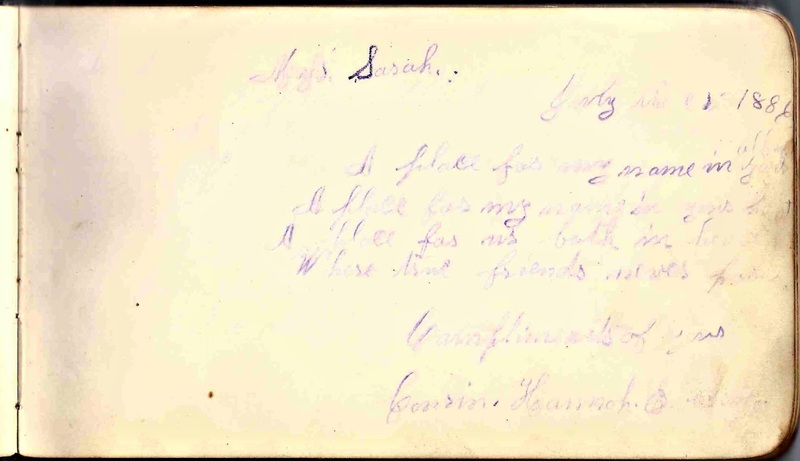 On 24 November 1886, Sarah married William W. Hennick. 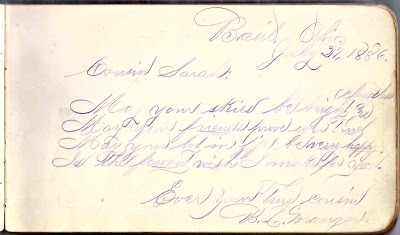 He signed the first page in Sarah's album on 21 February 1886 at Columbus, Ohio. 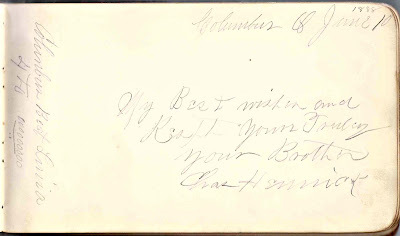 William's brother Charles Hennick signed a page at Columbus, Ohio, on 10 June 1888 and called himself Sarah's brother, though he was actually her brother-in-law. Sarah and William made their home at Columbus, Ohio, where William was engaged in the equine industry; they raised at least two sons. 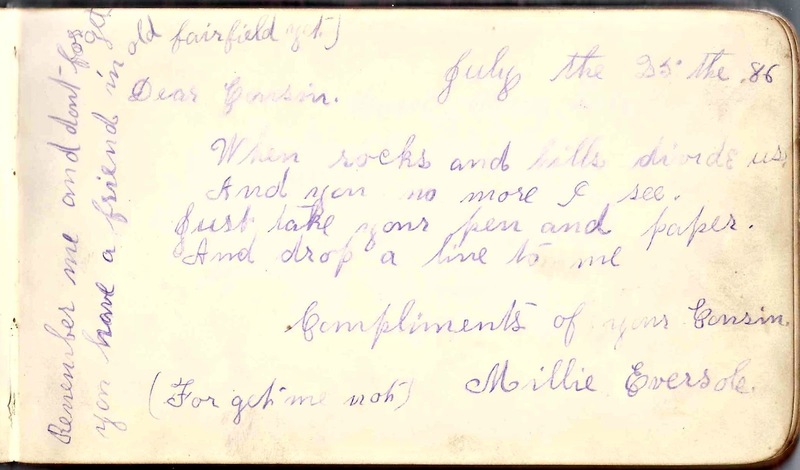 Millie Eversole and Hannah Eversole called themselves Sarah's cousins. 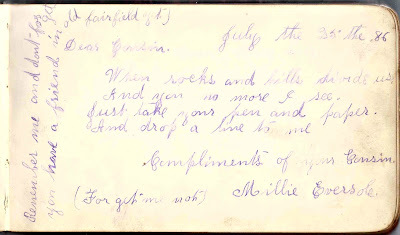 Millie signed her page at Fairfield, or Fairfield County, Ohio, on 25 July 1886. 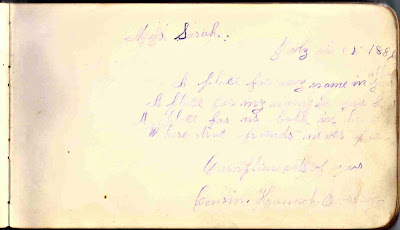 Hannah Eversole also signed a page in July of 1886. The Eversole surname is intriguing based on the fact that I found a reference in "The History of Fairfield and Perry Counties, Ohio: Their Past and Present", compiled by A. 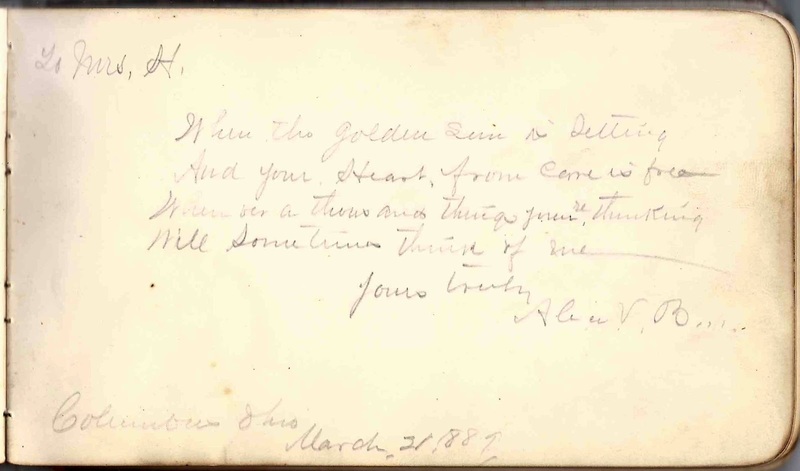 A. Graham and published in 1883, to a Maria Detwiler who married a Daniel Stout; her sister Susannah married David Eversole. 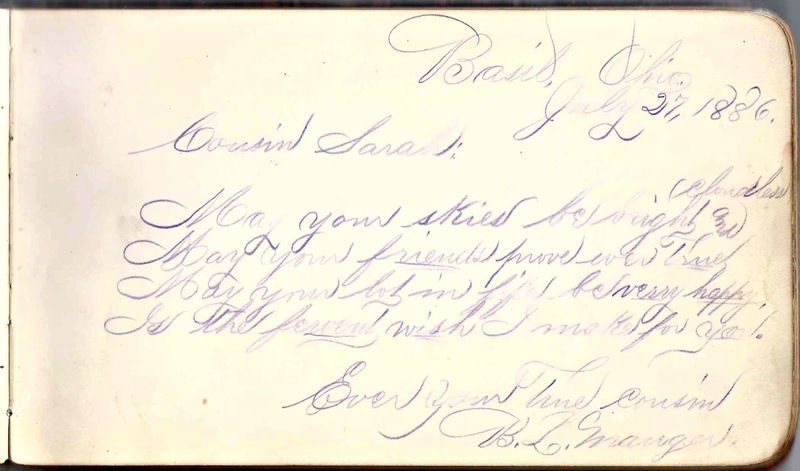 Another person who identified himself as Sarah's cousin was B. L. Mauger or B. 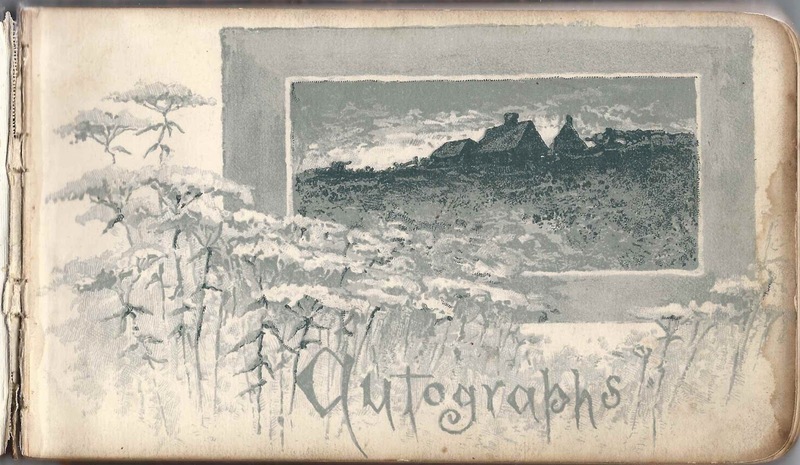 Z. Mauger, who signed a page at Basil, Ohio, on 27 July 1886. Two signers, whose last name was indicated by an initial or was a very short name starting with the letter B, are shown below. They may have been husband and wife or siblings or other relatives. Alice B. B? 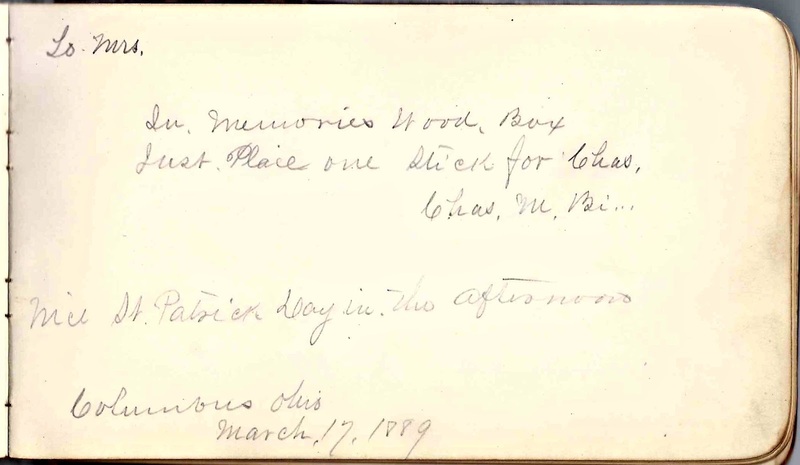 signed a page at Columbus, Ohio, on 21 March 1889. Charles M. B? signed at Columbus, Ohio, on 17 March 1889. Hopefully a reader with a theory as to their identity will leave a comment. 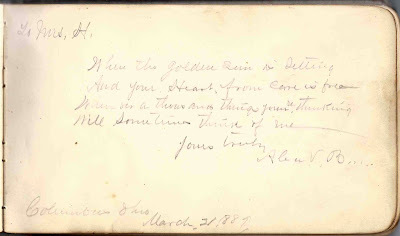 Alice V. B. or Alice V. R., signed at Columbus, Ohio, on 21 March 1889. Surname looks like Bin ? Another signer was Charles Bin ? perhaps a brother or husband? 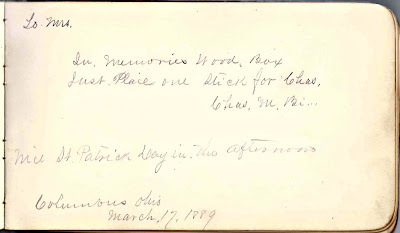 Charles M. Bin ?, signed at Columbus Ohio, on 17 March 1889; another signer, Alice V. Bi? also signed. James Conroy, signed at Columbus, Ohio, on 3 March 1891; middle initial might be P or T or? 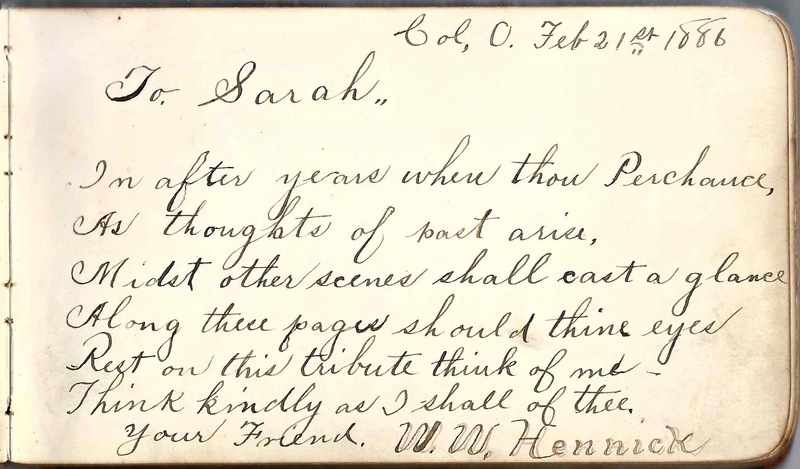 W. W. Hennick, signed at Columbus, Ohio, on 21 February 1886. 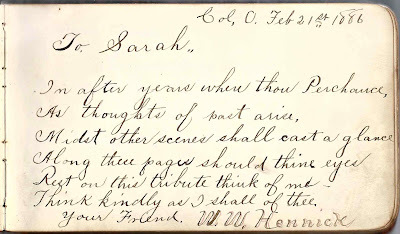 Sarah A. Stout and William W. Hennick would marry that year, on 24 November 1886. 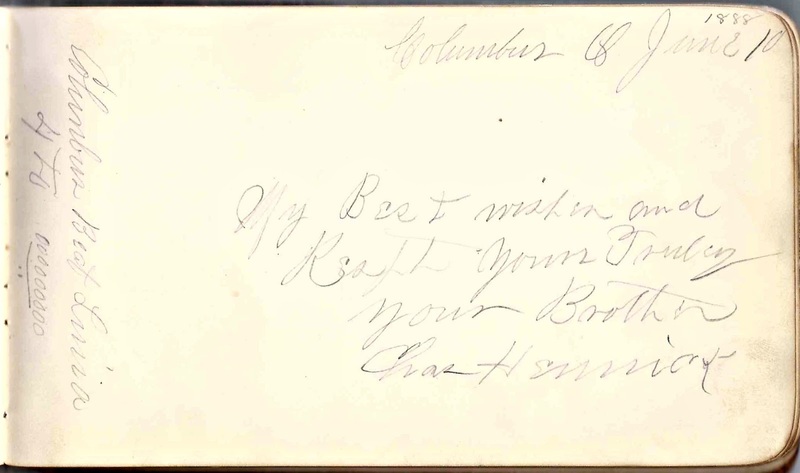 Charles Hennick, signed at Columbus, Ohio, on 10 June 1888; he called himself Sarah's brother - he was actually the brother of Sarah's husband William W. Hennick.